In the first of a series of occasional papers on NCD prevention and control the HCC examines Climate Change, NCDs & SIDS. Chronic non-communicable diseases (NCDs) including heart disease, stroke, cancer, diabetes and chronic lung disease account for some 7 out of every 10 deaths in Small Island Developing States (SIDS) including those of the Caribbean. This results in the expenditure of approximately 60% of health budgets in nearly all Caribbean countries. While it is easy to assume that the most common cause of NCDs are behavioural, such as exposure to tobacco smoke, unhealthy eating, physical inactivity and alcohol abuse, recognizing and understanding the connection between NCDs and environmental factors is critical, more so now than ever before. Climate change is one of the greatest threats to a sustainable future. Globally, this has been acknowledged by 195 countries who signed the Paris Agreement on Climate Change at the UN Framework Convention on Climate Change (UNFCC). This single act represents international recognition of the damaging effects of climate change and the unified commitment to curb emissions, strengthen resilience and take common action. Regionally in the Caribbean and in other Small Island Developing States (SIDS), there is a higher level of vulnerability to climate change. For example, typically-limited physical size of SIDS effectively reduces adaptation options to climate change and sea level rise. Natural resources are limited and already heavily stressed by current unsustainable human activities. A high susceptibility to natural hazards have the potential to cause significant loss and damage to frequently underdeveloped infrastructure and struggling communities. The extreme openness of SIDS’ small economies are highly sensitive to external market shocks. Most importantly, the impacts of climate change have the potential to worsen the NCD epidemic and frustrate efforts of Caribbean governments and other SIDS to meet global, regional and national NCD targets. Increased levels of carbon air pollution directly increase cases of cancer and lung disease. Adverse impact on the food supply result in unhealthy eating, order cheap tramadol overnight overweight and obesity. Urbanisation and the increase in motorized transport discourage healthier and active means of transport such as walking and cycling. Production of livestock and overreliance on red meats and processed foods contribute to more greenhouse gases and unhealthy diets. Large-scale atmospheric events such as hurricanes, storms and flooding result in further lack of empowerment and poverty. While these examples only present a very small sample of the current reality, climate change and NCDs are inextricably linked. 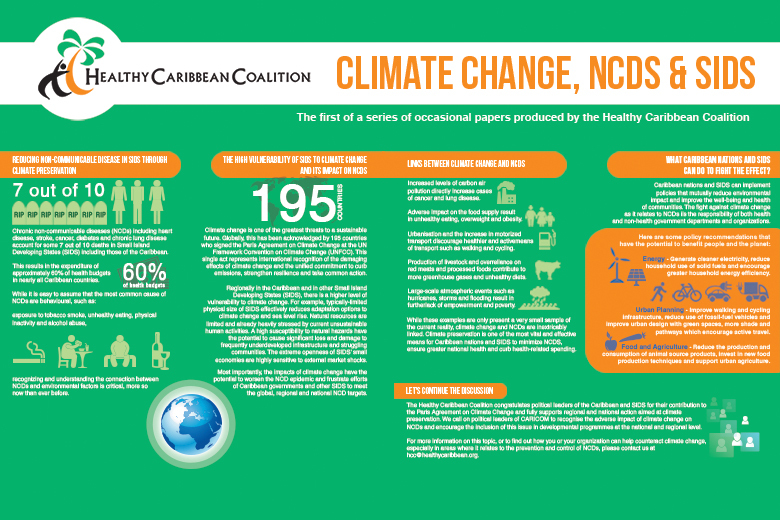 Climate preservation is one of the most vital and effective means for Caribbean nations and SIDS to minimize NCDs, ensure greater national health and curb health-related spending. What Caribbean Nations and SIDS Can Do to Fight the Effect? Energy – Generate cleaner electricity, reduce household use of solid fuels and encourage greater household energy efficiency. Urban Planning – Improve walking and cycling infrastructure, reduce use of fossil-fuel vehicles, and improve urban design with green spaces, more shade and pathways which encourage active travel. Food and Agriculture -Reduce the production and consumption of animal source products, invest new food production techniques, and support urban agriculture. The Healthy Caribbean Coalition congratulates political leaders of the Caribbean and SIDS for their contribution to the Paris Agreement on Climate Change and fully supports regional and national action aimed at climate preservation. We call on political leaders of CARICOM to recognise the adverse impact of climate change on NCDs and encourage the inclusion of this issue in developmental programmes at the national and regional level. 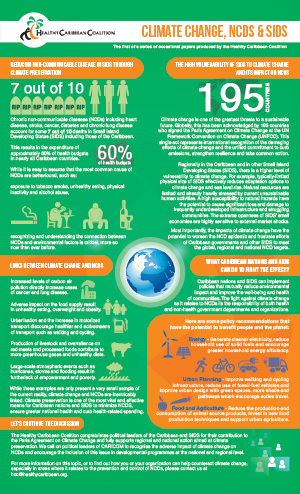 For more information on this topic, or to find out how you or your organization can help counteract climate change, especially in areas where it relates to the prevention and control of NCDs, please contact us. Download the graphic version here.